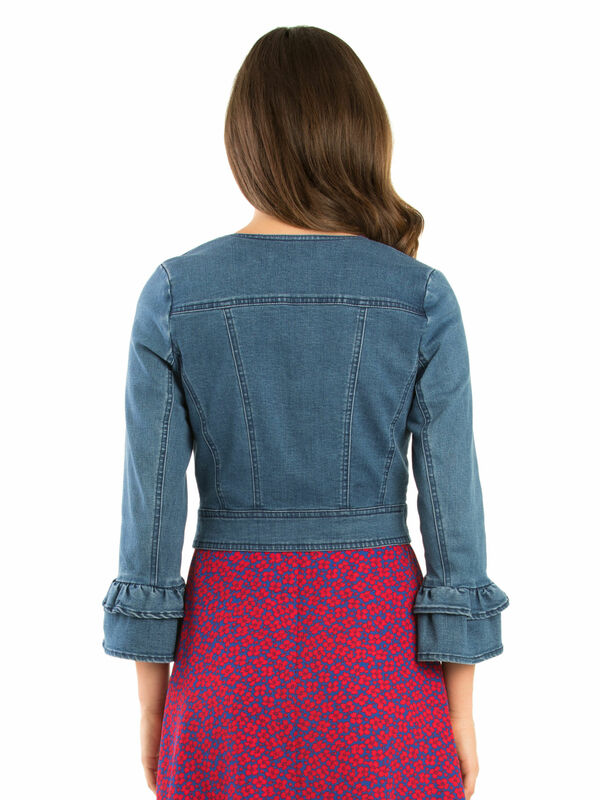 Carmello Denim Jacket https://www.review-australia.com/au/carmello-denim-jacket-blue/RE19JK020.REBLU126.html A contemporary twist on a classic design, this Cermello Denim Jacket is slightly cropped and features a polka dot lining. The addition of the flared cuff detail and rounded neckline makes sure this is your go-to choice for warm summer evenings. Layer over a colourful dress for an effortlessly chic look. Carmello Denim Jacket is rated 5.0 out of 5 by 20. Rated 5 out of 5 by Southern River from Never seen a jacket this cute! I saw and tried this jacket in Melbourne in January at 30% disc, but due to the expenses I’ve made during the holiday, I didn’t buy it. Last Sunday, I saw the jacket again in Sydney, on 30% disc again as a separate. I was so conflicted whether to purchase it or not, because e.g. I’ve never (and don’t want to) buy a jacket at that price. However, eventually I returned yesterday to buy it. I still feel guilty for the splurge, but I have to say the jacket itself is such a gorgeous piece of art. The ruffles on the arms make it very unique. Flirtatious, but not over the top. Goes well with my short tulle dress as well as my formal dress. Rated 5 out of 5 by ellyzamay from Layering Essential Most importantly, my measurements are B: 42 W: 36 and I purchased a size 16, which fit perfectly. I love the stretch the denim provides, the arms have been cut wide enough to move and the cropped length works well with dresses. I wasn't sure about the lack of collar, but it actually makes it a little bit dressy. This is a wonderful piece for the transitional seasons and chilly nights, I'm very glad I clicked 'buy'! Rated 5 out of 5 by Latty76 from Super Cute and Stylish I hesitated on this as I thought the sleeves were a bit much. Tried her on anyway and BAM love love love and she came home with me. A great modern twist on the evergreen denim jacket. Offers more style than the usual denim jacket so can be casual or smart casual. Had her one week and wore her twice already. She’s going to be well loved and I have welcomed many compliments on her. Rated 5 out of 5 by Katja from Very feminine I bought this jacket in Melbourne the day it arrived in the shop. Have worn it lots, mainly with my beautiful Review dresses . It goes so well with most of them. I love the fact it has no collar and the sleeves are so feminine. I am normally a size 10 Review but got a size 8 as it was a better fit. Rated 5 out of 5 by Hunter from Very cute jacket This dressy little number is so cute. The fit and style look particularly nice over dresses but can be worn over skirts and pants for that added touch of a feminine look. The colour is not too dark or too light so suits many outfits. I like the simplicity of no collar as well. Rated 5 out of 5 by G Hamilton from One of a kind demin jacket! Such a unique and gorgeous denim jacket and I'm thrilled it fits so well (I'm a size 6 and Review jackets are often too large but not this time, yay!). With its beautiful design and comfortable and flattering fit I'm sure to wear this often! Rated 5 out of 5 by Nickyc from The perfect denim jacket I have been after a denim jacket for quite a while so jumped at this when I saw it. I'm a standard size 8 and the fit is perfect. Lots of stretch for comfort and the sleeves make it super cute and stylish. The perfect denim colour too.